The trail began on Ogiura Beach. Between the soft, white sand and the calm, turquoise water, you almost changed your mind. The beach could have been your private hideout for the rest of the day. But you were promised an amazing view of not just the island, but the whole archipelago. So up you went. You passed through a tunnel from World War II, crossed a small river, followed an old farm road, found a dam, and saw endemic pigeons. And, yes, the view was spectacular. You’re on Chichijama, one of the volcanic Ogasawara Islands in the Pacific Ocean. The islands are remote, mostly uninhabited, and, since they were never connected to one of the continents, full of animals and plants that aren’t found anywhere else in the world. It’s not surprising that they’re called the Galápagos of the Orient. As of a few years ago, they’re a UNESCO World Heritage Site, as well. That doesn’t mean the islands are easier to access. The Ogasawara Islands have never been easy to access actually. They were formed 48 million years ago, and evidence of prehistoric tools have been found on them. But the islands were uninhabited when Europeans discovered them in 1543. Control of them went back and forth between the Japanese and the British, until Americans formed a colony, on what they called the Bonin Islands, in 1830. Descendents of the original settlers still live on the two largest islands, Chichijama and Hahajima, today. The islands haven’t always been peaceful, though. The Japanese reclaimed and renamed the islands, and then World War II brought fierce battles. The Japanese weren’t allowed to return until the late 1960s. The Ogasawara Maru, an ocean liner, now departs from Tokyo every six days. More than 25 hours (in good weather) later, it arrives in Futami Harbor on Chichijima. There’s been talk of an airport for years, though few people seem confident that it will ever be built. But the difficult access has left the 30 tropical islands largely untouched. They’re full of empty beaches, limestone formations, and picture-perfect lagoons. 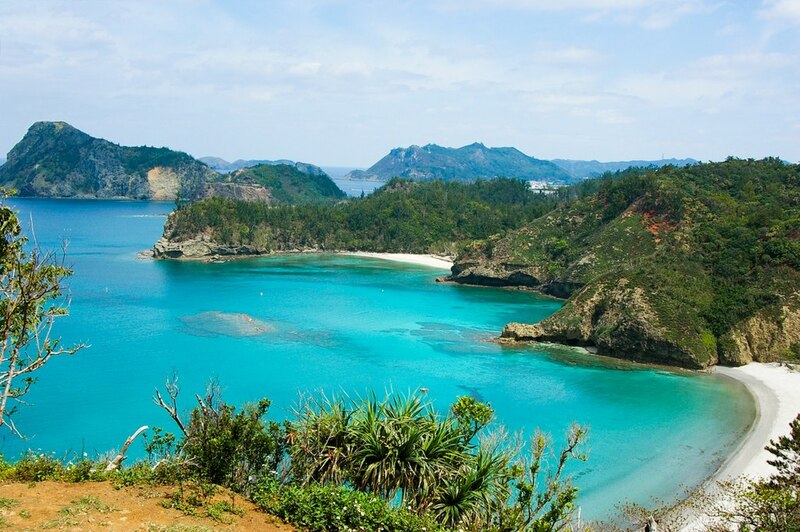 On Minamijima, a rock arch over one of those lagoons might be the most beautiful spot in the Pacific. Little Bonin petrels and giant Bonin flying foxes greatly outnumber people on the forest-covered islands. While giant squid, whales, and dolphins live in the surrounding water. For once, beach time can wait. Wow that blue !!!! So intense and beautiful! !